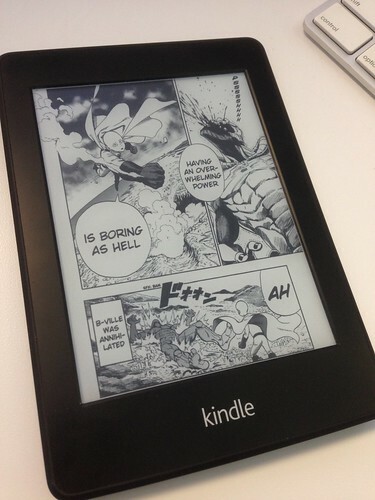 Here’s a quick guide to putting free Manga on a Kindle. MangaScraper – for grabbing images from free online scanlation (fan translation) manga sites. Unfortunately this is only available for Windows. If you know a Mac version, let me know! 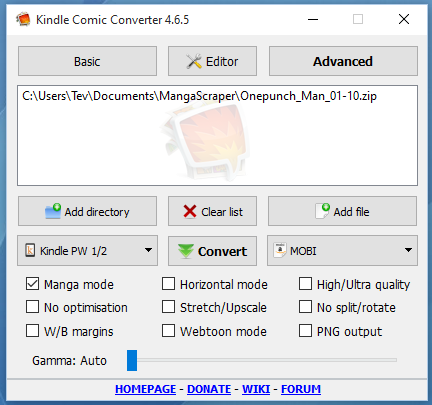 Kindle Comic Converter – for converting the images to Kindle size and saving a Kindle-compatible .mobi file. You will also need to download KindleGen and copy it to the Kindle Comic Converter folder once it’s installed. Calibre – optional, if you want to add a cover image. Browse one of those sites and find something you like. For this example I will use OnePunch Man from EatManga.com. Open up MangaScraper, select the source site, and type the name of the series. MangaScraper will show matching results, select the one you want and it will then show available chapters below. 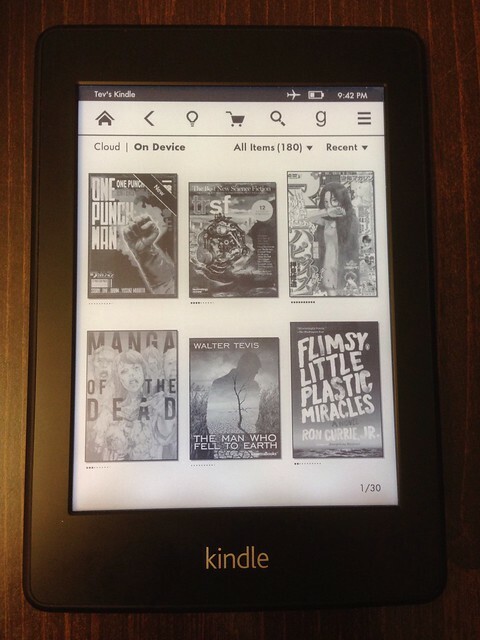 It’s a good idea not to make ebooks too big so the Kindle can handle them. I like about 10 chapters per ebook. Select the chapters you want (in this example, I’ve selected 1-10), set a target location to save, choose “Folder” as the output, and hit “Save”. 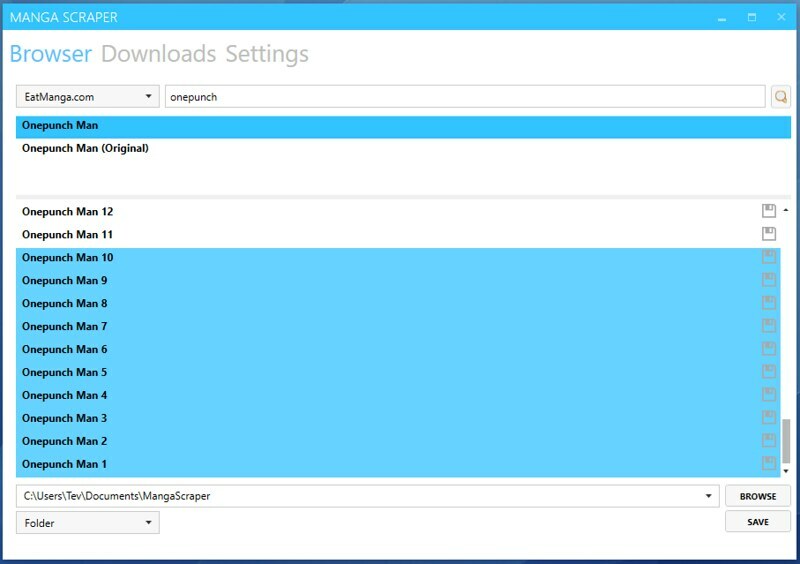 An arrow in the upper right will flash for a while as it downloads. Once it’s complete, we’re ready for the next step. Make a new folder with an appropriate name (in this case, I called the folder “Onepunch_Man_01-10”) then put the folders you just downloaded inside. Zip the folder. On Mac, right-click and choose “Compress”, on Windows, right-click and choose “Send to > Compressed Folder”. Open Kindle Comic Converter, and drag the .zip file to it. Choose your target device (Kindle PW 1/2, in my case). Check “Manga mode” – this will make the ebook pages turn right to left, like the original manga – so instead of tapping the right edge of the screen to go to the next page, you tap the left edge. It will also ensure that 2-page spreads are shown in the correct order. If you prefer turning pages the Western way, you can leave it unchecked. A .mobi file will be generated (it will generate an .epub file and then convert that to .mobi). Connect your Kindle to your computer with a USB cable, copy the file over to your Kindle’s documents folder. The only flaw with Kindle Comic Converter is it doesn’t create a cover image (it does create one, but Kindle doesn’t read it correctly). If that’s important to you, you can take the extra step to add one with Calibre. Calibre is a super-useful ebook library manager, so you can also use it to organize your manga ebooks. It’s overkill for just adding a cover image, but here’s how. 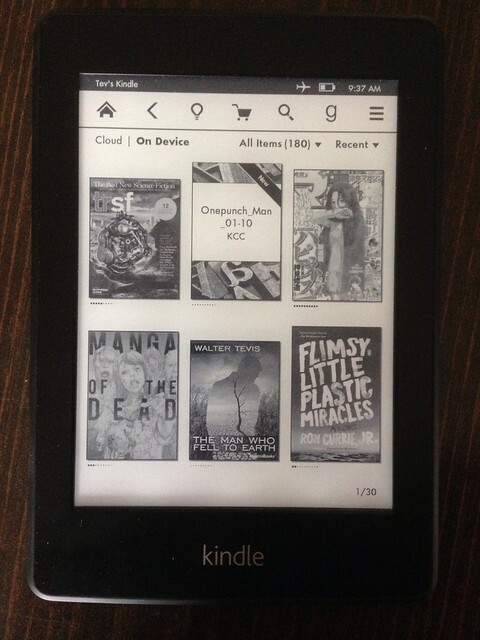 Open Calibre, choose Amazon Kindle Paperwhite (or your device) as the default device. Create a new library with the name and location you want. Drag the .mobi file you generated to Calibre. It will add a copy to your library. Select the book from the list in Calibre, choose “Edit Metadata” (the big “i” icon in the menu). Drag the image you would like to use to the cover image area and hit “Ok”. Plug your Kindle in and it will show up in Calibre. Right-click the ebook in the Calibre list and choose “Send to device”. It will show a status in the lower right, when it completes, you can choose “Eject this device” from the device in the top menu. That’s it, get to reading! 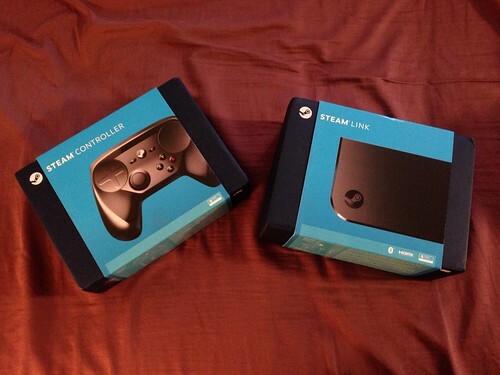 I pre-ordered the Steam Controller and Steam Link a while back, they just arrived today. Here’s what’s in the box and my initial impressions. 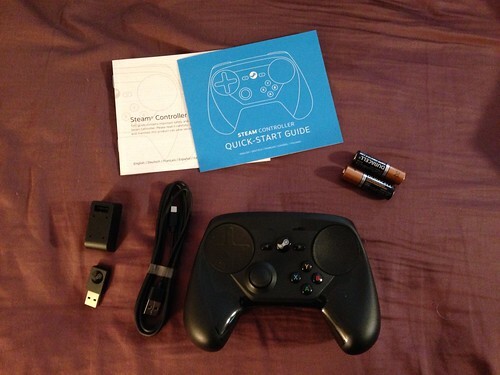 The Steam Controller. Comes with wireless dongle, USB extension for wireless dongle, batteries, and manuals. Steam Link. 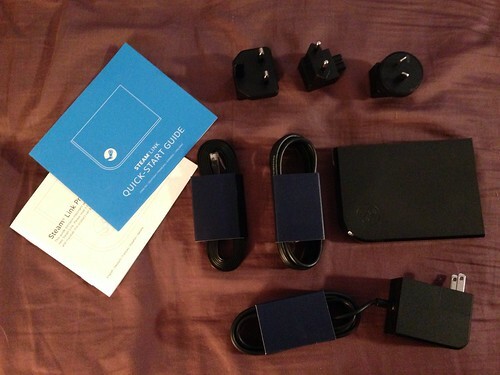 Comes with HDMI cable, ethernet cable, power adapter, plug adapters for use outside USA, and manuals. So, how do they work? Pretty well, with some caveats. The controller feels solid, not too heavy but not light, approximately the same weight as the Xbox360 or PS4 controllers (since that’s what I have, that’s what I’ll compare it to). It’s slightly bigger than either of those, with a lot of surface area. 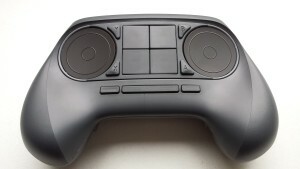 The first thing I noticed was the upward tilt of the upper half of the controller, this makes the trackpad surfaces easier to reach with your thumbs. Buttons buttons buttons. This thing has a lot of buttons. There are the standard 4 by your right thumb, 4 trigger buttons (2 left, 2 right), and left and right “squeeze” triggers, start/system/select buttons, and trackpad 1, trackpad 2 and thumbstick clicks. That’s 16 buttons, 2 trackpads and a thumbstick. Plenty of controls to work with. I’m not sure if the trackpad have multiple switches underneath or just one using the trackpad for position. The left thumbstick works great. Same position as the PS4 left thumbstick, if you’re used to that. Start / system / select buttons work as expected. The L2/R2 triggers don’t have as much play as the Xbox360 or PS4 controllers, not sure if that will cause issues for racing games where analog trigger pressure is important. L1/R1 triggers feel placed a little high, but feel clicky and responsive. Putting my index fingers on them makes me want to position my thumbs higher, no longer in the center of the trackpads. I haven’t tried this in practice though, so it might be fine. The left and right “squeeze” triggers, which you can trigger with any fingers not on the L1/L2/R1/R2 triggers, are comfortable and easy to use. I could see mapping these to primary actions like “use” and “jump”. X/Y/A/B buttons differ from other controllers. On Xbox360 and PS4, those buttons have primary placement next to your right thumb, with the right thumbstick below that. The Steam controller swaps this, giving the right thumbpad primary placement and the buttons in the secondary spot. This will take some getting used to, every time I went to hit them, the buttons were lower than I expected and requires “reaching” your thumb from the relaxed position of resting on the thumbpad. Thumbpads – this is where the Steam controller stands apart from others. The PS4 controller does have a small touch area above the thumbsticks, but it’s in a very tertiary spot that would be uncomfortable to use for any length of time, since you have to reach over the thumbsticks to get to it. On the Steam controller, the thumbpads are given primary spots, your thumbs naturally rest there. In the original design, the thumbpads would replace all other controls, but after poor initial response, the traditional thumbstick and buttons were added. The thumbpads are still the primary controls, designed to replace a d-pad and right thumbstick (or mouse). They seem ok, but will take getting used to, and I’m not sure how good a replacement it will be for a right thumbstick. The Steam Link is pretty straightforward. You hook it to the TV and ethernet, power it on, and connect it to a computer on the same network that’s running Steam with streaming enabled. Per Valve’s suggestion, I updated that computer to the latest beta of Steam Big Picture so I’d have any Steam Link / Steam Controller patches. 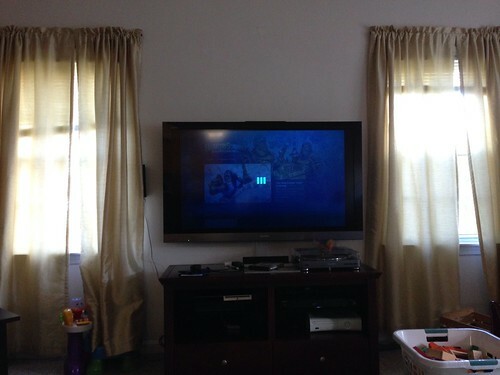 It turned on, though there was a little resolution jitter before showing the “select language screen”. Then I selected my computer from the list and Steam Big Picture fired up. Setup was fast and easy. Playing games worked well, video seemed flawless and there was no noticeable controller lag. I only had a short time today (on my lunch break) to try out a few games, so this is just a quick initial test. Ori and the Blind Forest – this is a pretty platformer, which requires timed jumping. I didn’t experience any controller lag, though it did take some getting used to the button locations. I’m used to Xbox360/PS4 buttons, and the Steam controller’s are lower, so any time I took my thumb off the buttons, I would flounder momentarily or press the wrong button when I went to jump. I expect I’ll get used to this, though. Overall it seemed solid for platforming. The Talos Principle – this is a first-person puzzle game. It doesn’t require a lot of fast reacting for the most part, so I figured it’d be a good calm place to try out FPS controls. The default control configuration was… not great. The virtual right thumbstick just wasn’t doing it for me. I tried out mouse/keyboard mode, which made the right thumbpad more responsive, but was more absolute positioning instead of relative, so still didn’t feel right. I tried a couple user-submitted profiles, but they weren’t quite right either. I imagine finding the right mapping for FPS games is going to be a mix of user-submitted profiles as well as in-game control settings. This could be frustrating, only time will tell. 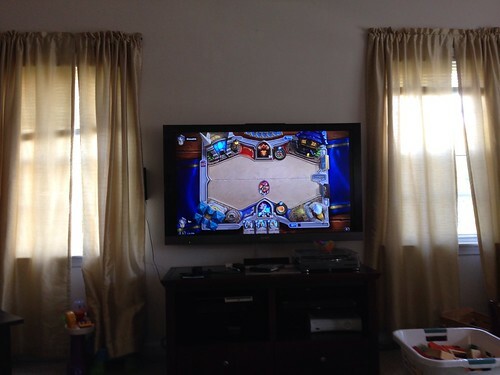 Hearthstone – is both a non-Steam game and a mouse-based game. It worked great! Mousing around felt ok, with the default mapping of left-mouse-click mapped to R2 and right-mouse-click mapped to the L2. This sounds backwards but feels normal, since the right trigger is the primary action. I played a quick game (and won) and it felt fine. A little like using a trackball, but acceptable. What was unclear was how to *stop* playing. There’s a “Shutdown Steam Link” option on the menu, but it didn’t seem to do anything. If it *did* shut down the Steam Link, I’m not sure how you’d turn it back on, since there’s no power button on it. The issue with this is the controller is still paired, if I left it going it’d be wasting batteries. I eventually settled on choosing “Disconnect Controller” and then physically unplugged it. It does not seem like the right way to do it, I’ll have to look online and see what you’re supposed to do. 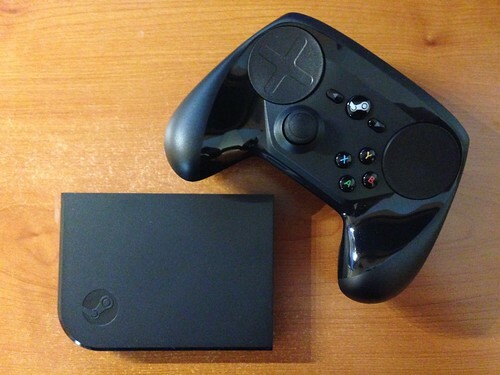 That’s it for my quick first impressions of Steam Link and the Steam Controller. Mostly positive, but on the controller, some qualms about the right thumbpad as virtual thumbstick and the button placement, and on the Link, some issues with exiting non-steam games and how to turn the Link off.